There is a need for flexible and affordable plant phenotyping solutions for basic research and plant breeding. Czedik‐Eysenberg et. al. (2018) recently developed an open source plant imaging and processing solution (‘PhenoBox’/ ‘PhenoPipe’) and provided construction plans, source code and documentation to rebuild the system. The abilities of the PhenoBox were tested on three divergent case studies - providing conclusive information about it versatility. 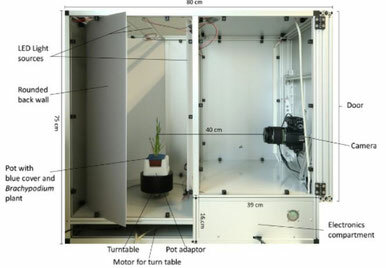 It can be concluded, that the authors have developed an very affordable (about 3500$ consumables), automated, open source imaging (PhenoBox) and data processing (Phenospex) solution that will hopefully be adapted to various phenotyping applications in plant biology and beyond. Files: The complete source code to run the PhenoBox and PHENOSPEX software, together with a detailed documentation in wiki format, can be found at https://github.com/Gregor-Mendel-Institute/PhenoBox-System. Please get in contact if you need any help building the hardware of this excellent open source phenotyping instrument or if you are interested to adapt the design to your requirements (e.g. to increase the size for larger plants).